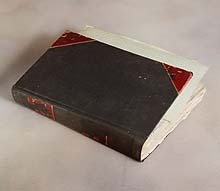 Distinctive Bookbinding has been restoring and conserving antique books for decades. The art of book restoration has been practiced for centuries. Our craftmen have been expertly trained to carefully handle rare and precious books. Bringing treasured books back to life, while preserving the integrity and design that the original bookmaker had intended, is an art we practice daily. We are capable of delicately handling and restoring torn pages, or rebinding a well-loved book by expertly hand sewing the pages together again. 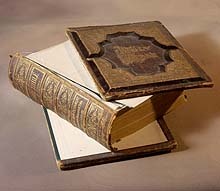 Clients may choose to simply recover an old bible, family album, or treasured book using new leather or cloth material. Or, we can re-gild a worn cover, or repair a torn leather, paper, or cloth cover, perserving as much of the original as possible. We can also restore many other antique items such as leather bags, frames, watchbands, wallets, and most other antique leather articles. 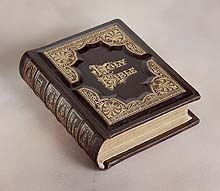 We are experts in debossing or stamping to create the engraved look you see on the family bible below. While we do not do embossing, which is a "raised" effect, we do what is called debossing, which means to press deep into the leather. Call or email us to discuss your restoration needs, including prices, at 800-616-9111, or email service@distinctivebookbinding.com, or go to our customer service page. We can give new life to your special treasures. 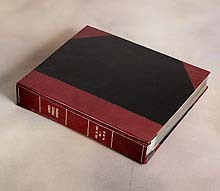 Copyright © 2005 Distinctive Bookbinding & Leather Designs, Inc.